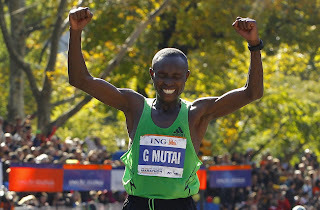 Don't be impressed by the headline of this post, I wasn't channeling Geoffrey Mutai winning the ING NYC marathon this morning. Quite the opposite, actually. While Kenyan runners regularly hit five minute miles in competition, they tend to do their long recovery runs at an extremely slow pace. That was my plan today and I kept to it. The training schedule that I've followed over the last few years has been to run five days a week, with additional cross training on a 6th day. I rest on Mondays unless I'm not feeling well or if I'm tapering for a race. With a schedule like that, I shouldn't have issues with running strength or stamina but I sometimes hit the wall around 30 minutes into a run. Since my policy has always been, "Once I start, no stopping" I run through these low points and will occasionally rebound strongly. People have said that even though my frequency is high, my base is fairly low. This is true. My weekday running distances average 2.5 miles due to time limitations. On weekends I'll go longer, but the shorter runs play havoc on my base. My monthly mileage numbers this past November and December were down about 10% from the prior year. I know it's because I wasn't consistently doing 7+ mile distances as I had in 2010. I've decided to work on my base with 5 miles being my lower limit for weekend runs. Last Sunday I ran the 5 mile Hangover Run and this morning I did a 5.4 mile neighborhood run. Five miles isn't particularly long but I needed to motivate myself to get out today after suffering three tough runs since Sunday. I figured that running slowly would make it easier -- and it was -- until I hit 4 miles and started to suffer fatigue. I didn't fully understand why, since I'd run over a minute/mile faster last Sunday. 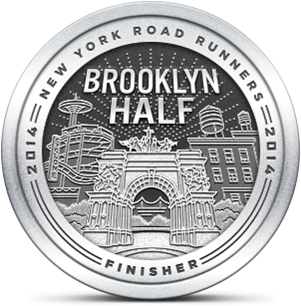 Unfortunately, running like a Kenyan didn't yield the results that I'd hoped to attain. A week of tough running has convinced me that I need to give myself a two-day break to restore my fitness to normal levels. Since I can't resist running on weekends, I'll target Monday (my usual rest day) and Tuesday as recovery days. I'll see if that does any good when I get back to it on Wednesday.